Paul Tumey found the Ahern CHOFF, which came as a surprise. I know of no other cartoonist who used this device. 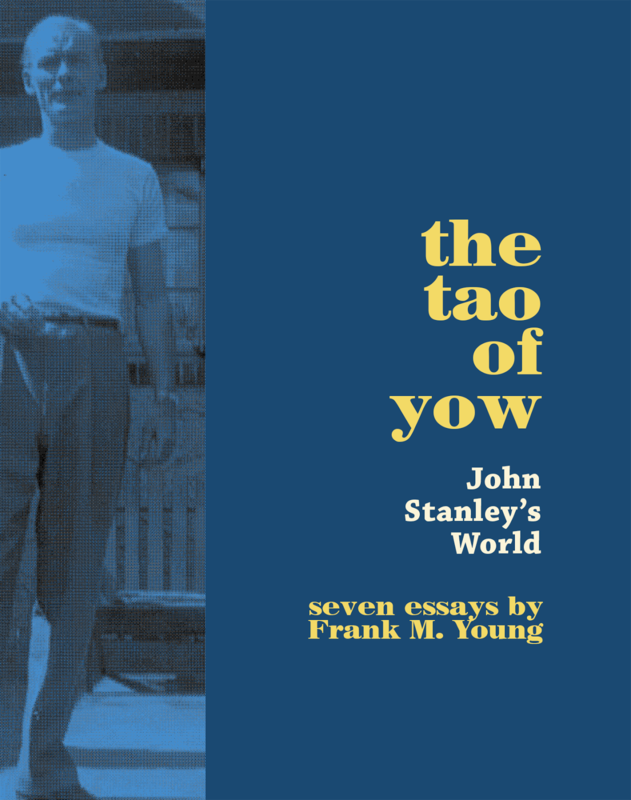 "YOW!" 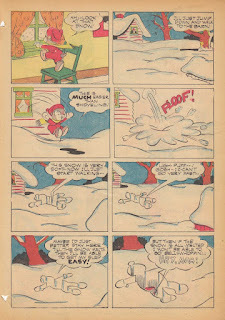 is widely used, throughout the history of comics. 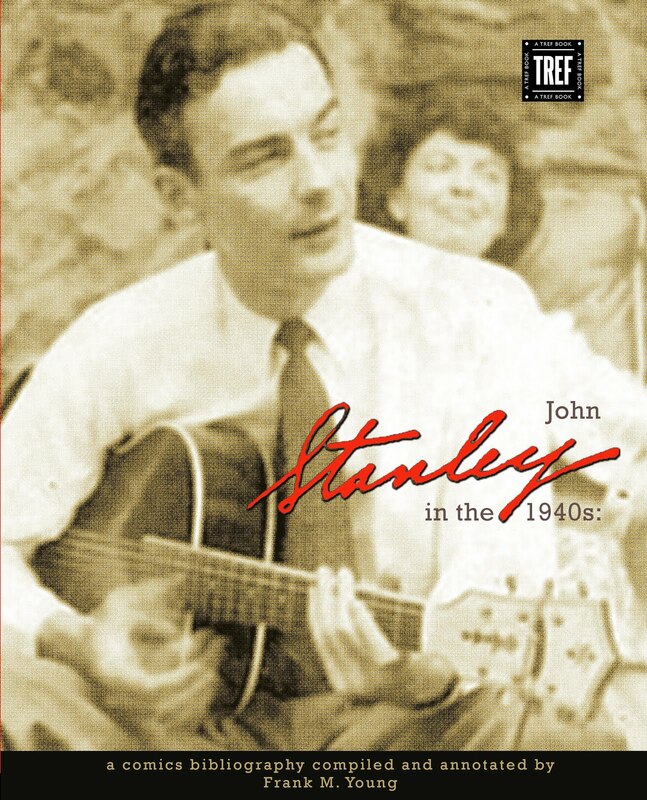 It can't truly be called John Stanley's property. "CHOFF," until recently, I considered Stanley turf. 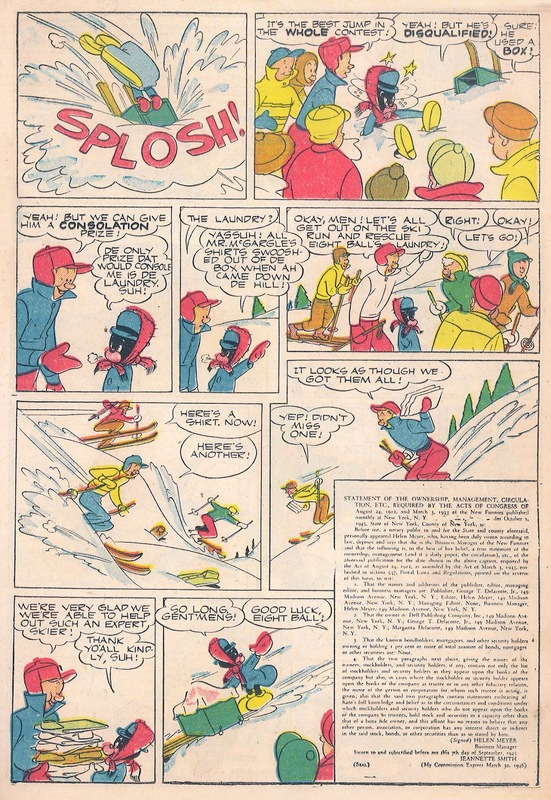 Stanley first used this bit of onomatopoeia in 1944. I haven't read enough of Ahern's work to determine the date of his first "CHOFF." Aren't you glad someone, in this cold hard world, thinks about these things? 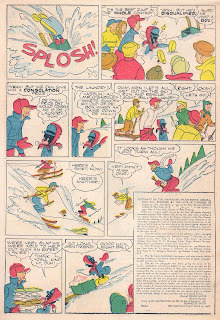 Little of Gene Ahern's picaresque work has been reprinted. 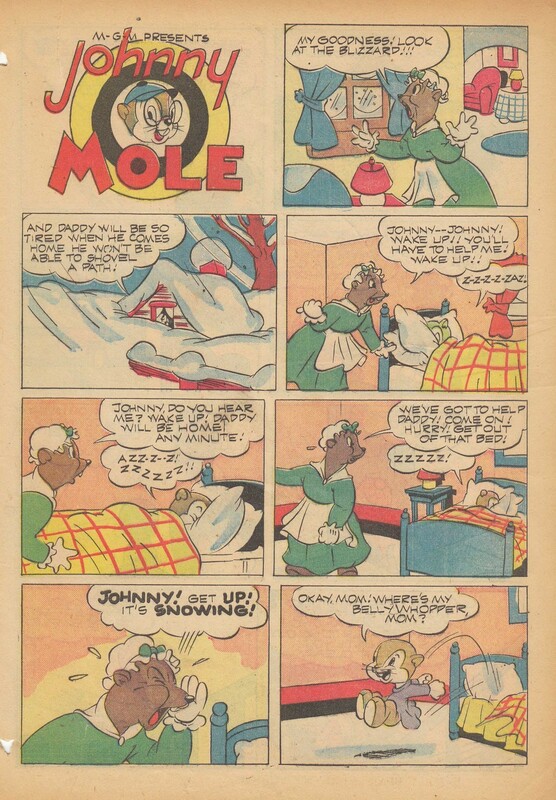 His comics are ripe for revival. Like the work of W. C. Fields, they may be funnier now than they were 60 to 80 years ago. You can read more about Gene Ahern--and sample many of his fascinating comics--at my friend Paul Tumey's new blog, The Masters of Screwball Comics. 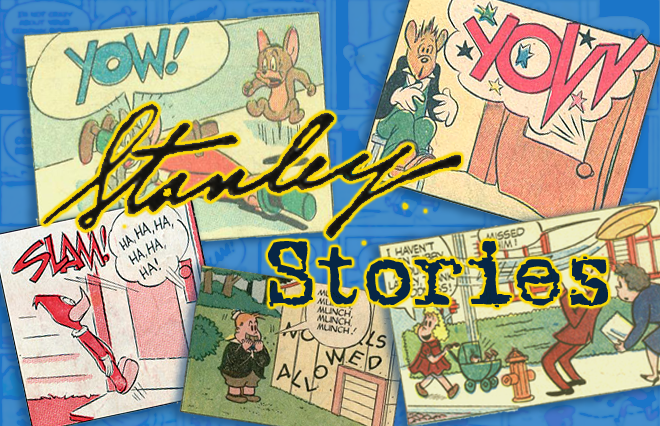 Today's pair of (admittedly obscure) stories feature strong examples of Stanley's use of the Tubby type outside of Little Lulu. Each stars a marginal animation character whose life in comic books far outlasted their time on-screen. 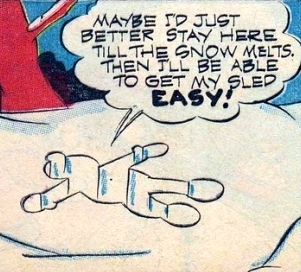 We'll start with the most contentious figure in John Stanley's career--Li'l Eight Ball. 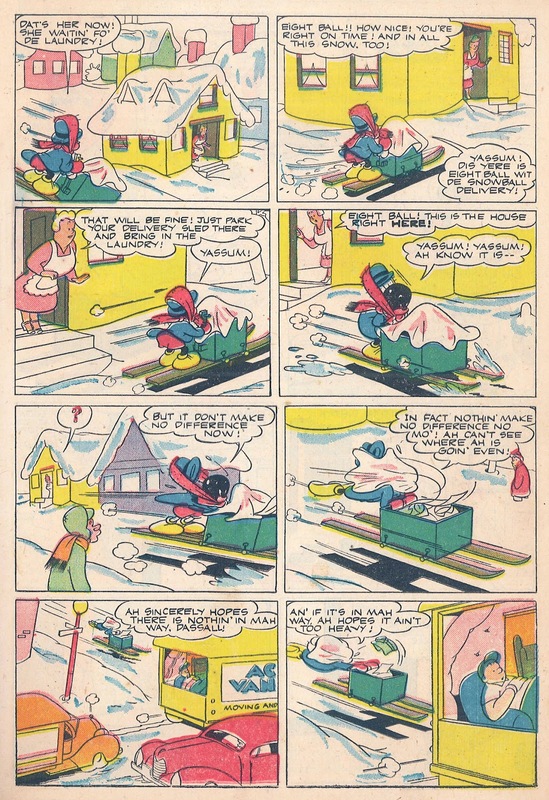 Though Eight Ball's three screen appearances occurred in 1939, the character was kept alive in the pages of Dell's New Funnies for almost another decade. The reason, most likely, was to fill up the pages of the monthly anthology. Another Lantz non-starter, Homer Pigeon, outlived his screen version by many years in New Funnies, as did Oswald the Rabbit, whom Lantz pretty much abandoned in the late 1930s, but revived for a final, abortive 1943 cartoon. 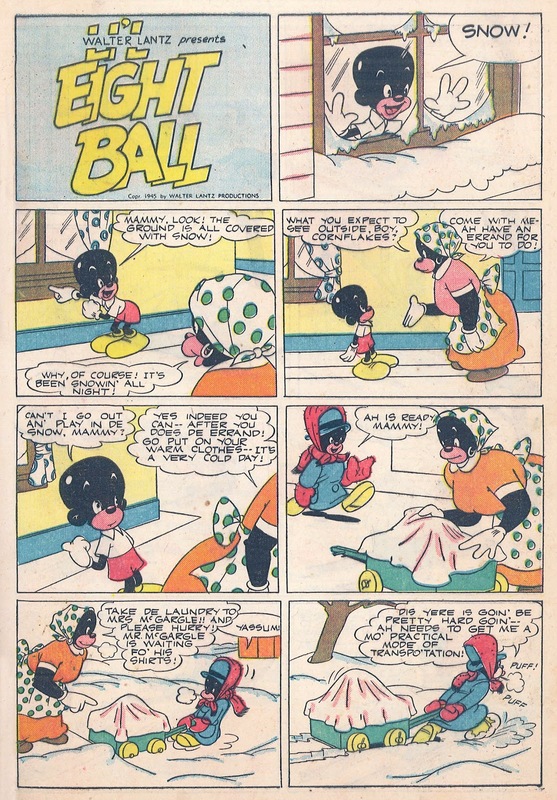 The treatment of the Eight Ball character, in New Funnies, exemplifies the awkward transition of racial stereotypes before, during and immediately after World War II. 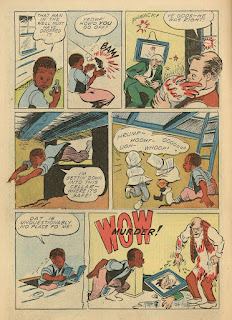 African-American stereotypes intensified right after the war's end, just as they did in the years after World War I.
Oskar Lebeck's staff of comics creators struggled with Eight Ball in the mid-1940s. I have no knowledge of the racial beliefs of Lebeck or his staff. 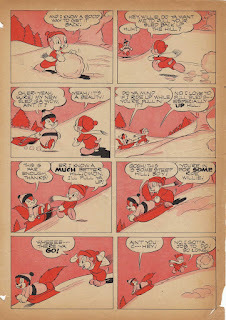 We know that Walt Kelly had strong liberal leanings in his newspaper Pogo strip, but little of this appears in his Lebeck work. 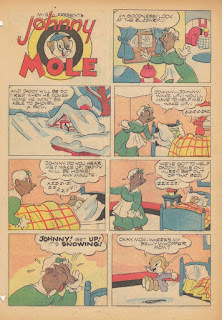 His early "Albert the Alligator" material also features stereotyped African-American characters. In contrast, his low-key, long-running "Our Gang" feature has a black character (Buckwheat) who is on equal standing with his peers. 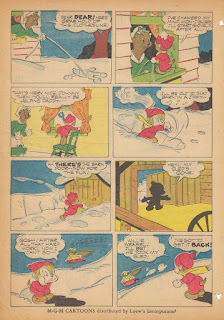 As this 1944 page from Our Gang Comics 14 shows, Kelly's Buckwheat is slightly more realistic than (though just as grotesquely caricatured as) Eight Ball. The warmth and whimsy of Kelly's work went a long way towards softening the blow, but the sting of racial reduction is still felt. 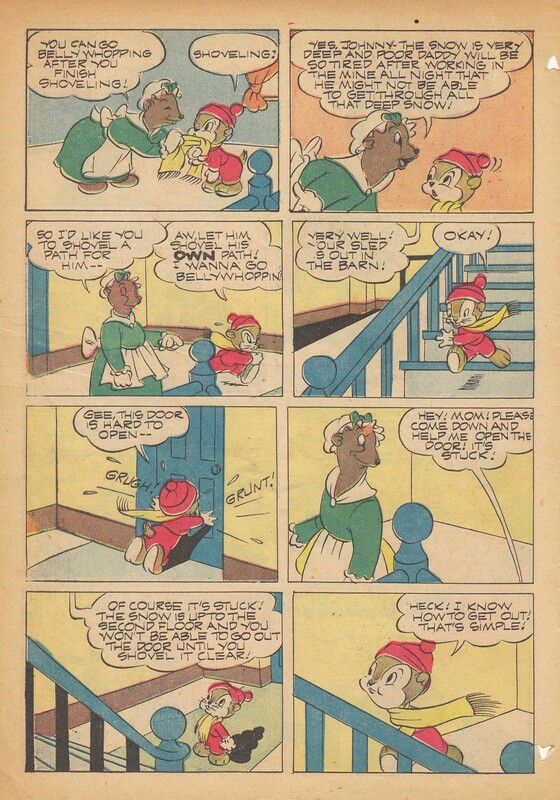 Buckwheat was the first to gradually shed his hesh mah mouf dialogue; it's gone from the strip by 1945. 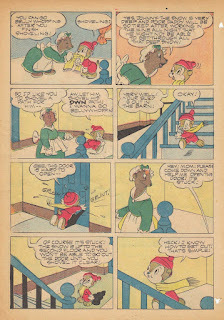 Kelly kept Buckwheat in the "Our Gang" cast until issue 44, in 1948, when he disappears, without comment, from the strip's cast. Such caricatures were part and parcel of mainstream American media throughout the 20th century. For a late example of racial reduction, one has to go no further than Ron Howard's 1986 "comedy" Gung Ho. Subservient Asians, larcenous Gypsies and mono-syllabic Native Americans remained in mass media (and, in some cases, still linger) long after the minstrel-show African American finally disappeared from the horizon. 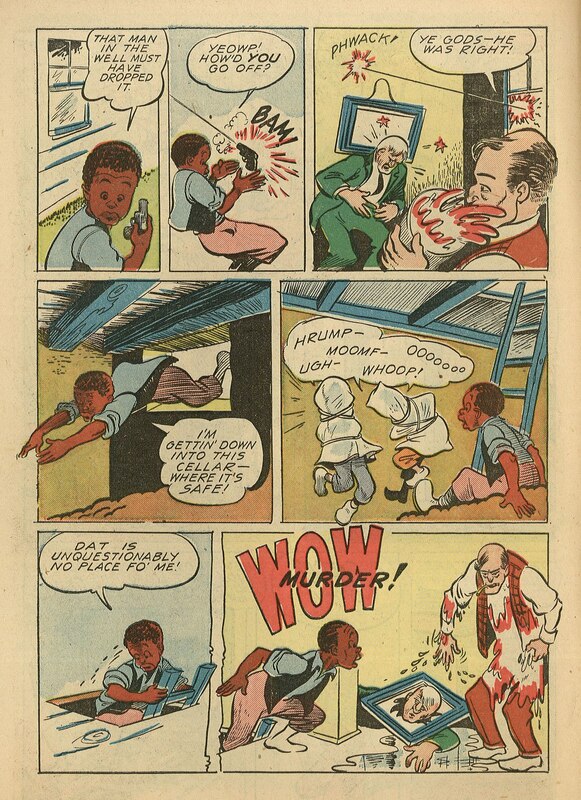 Even in the racially-challenged 1940s, Eight Ball was clearly something of an embarrassment to Lebeck's creators. His rural, sub-Joel Chandler Harris mush-mouthed earlier episodes gave way to more modern, urban settings. Gradually, the minstrel-show dialect vanished from the strip, although Eight Ball's nightmarish visage never changed. 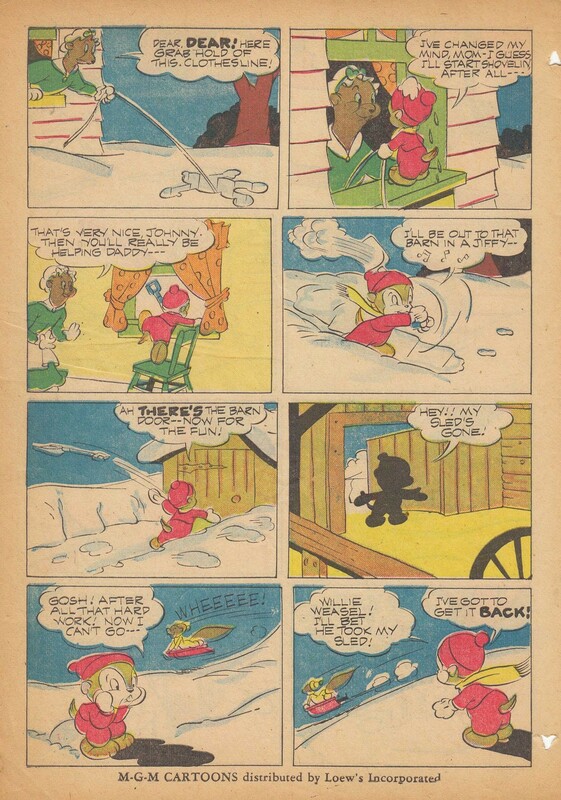 By 1946, Eight Ball (and the other, lighter-skinned African-American characters in the feature) talked the same as the Caucasians--and the "white" funny animals--in New Funnies. 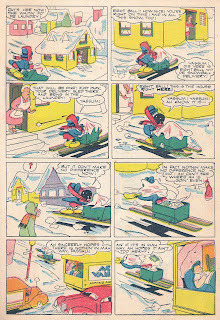 Eight Ball still talks in minstrel show das-dem-dese in this early 1946 episode, but his blackness ceases to be otherwise noted. 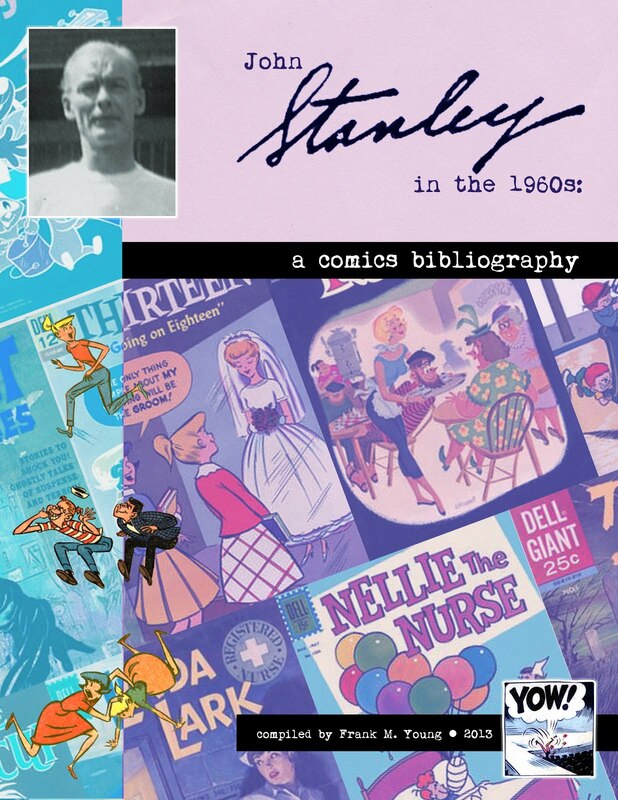 Perhaps Lebeck's staff (Stanley included) thought this might help make the character less of a shame magnet. A visual re-design of the character was probably out of the question by this point. It's hard to get past the surface in these stories, but there are rewards. Eight Ball's stubborn tenacity to succeed, despite impossible odds, elevates this story above its obvious, cringe-worthy elements. Change Eight Ball to Tubby, replace the mush-mouth dialect with Tub's Caucasian kid-talk, and this could pass for a circa-1952 Little Lulu back-up feature. 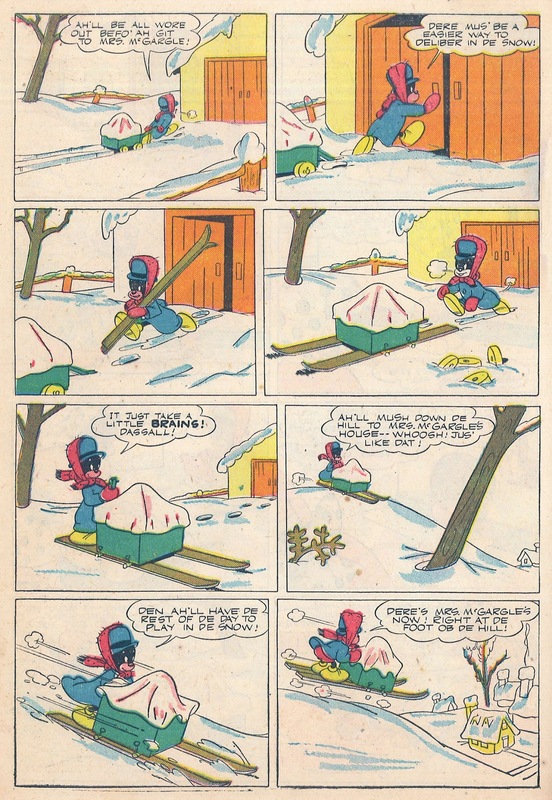 The piecemeal aspect of these Lebeck anthology comics is painfully evident here. 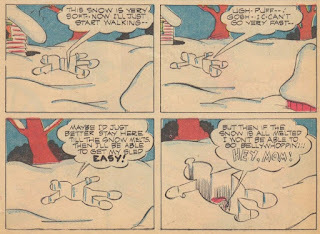 Besides having to work around that obnoxious rectangle on the last page, the story seems to want to go longer. The sub-plot of the businessman McGargle, forced to wear the Hawaiian shirt to his board meeting, would have been catnip to Stanley, given more pages. The Tubby-figure's unexpected acclaim at the ski jump contest would have been nullified, or dampened, by the outcome of the McGargle incident. 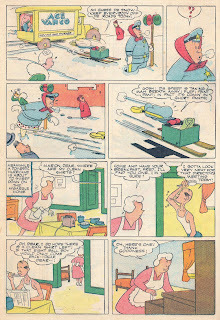 This carelessness reveals the lack of interest held in the Eight Ball character by Stanley and his colleagues. 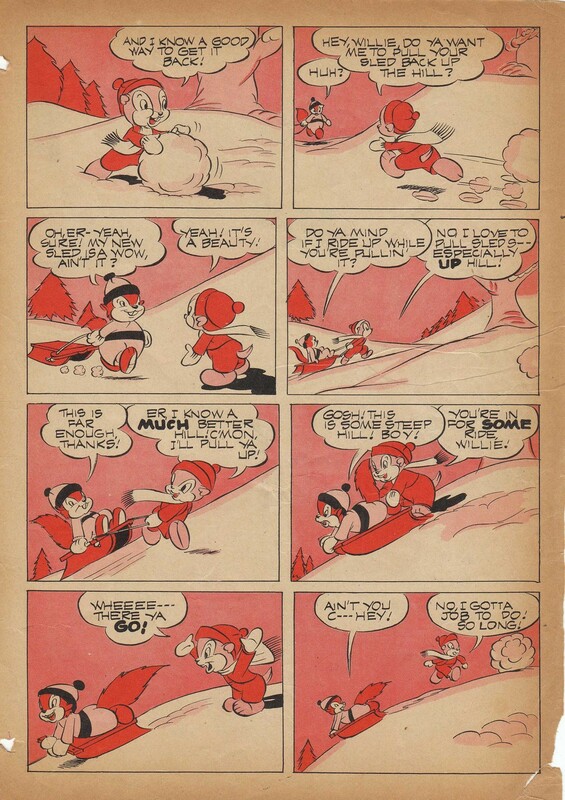 The magazine's other black hole, "Homer Pigeon," was usually farmed out to West Coast cartoonist Vive Risto, but "Eight Ball" continued to be produced through Lebeck's New York office. It was clearly a chore for whomever had to produce the feature. When "Eight Ball" was dropped in 1947, due to protests from Greenwich Village grade school children, Lebeck's staff might have breathed a huge collective sigh of relief. The self-determination, against impossible odds, the retreat into inaction and the realization that the original goal will be lost if something isn't done quickly--this is the essence of the Tubby type at work. These four panels, with their static staging, energized by the Quixotic ramblings of a misled character, are unmistakably the work of John Stanley. 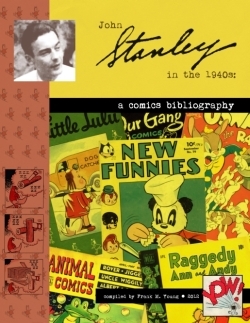 Neither of these stories are highlights of Stanley's q.v., but they show that the Tubby archetype was important to their creator, and often the guiding force of his work in the 1940s. Stanley would perfect the Tubby character by 1950, in stories such as "The Gourmet" (Little Lulu 5) and "Great Day" (LL 23)--both readable elsewhere on this blog. Thanks for your reply. 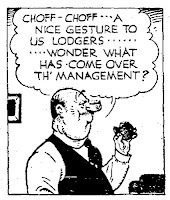 I think Ahern's CHOFF appeared in the 1940s, in ROOM AND BOARD. 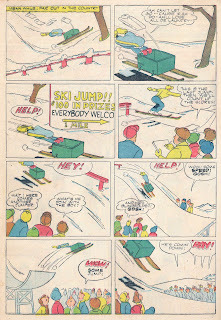 I haven't seen any occurrences in his run on OUR BOARDING HOUSE. 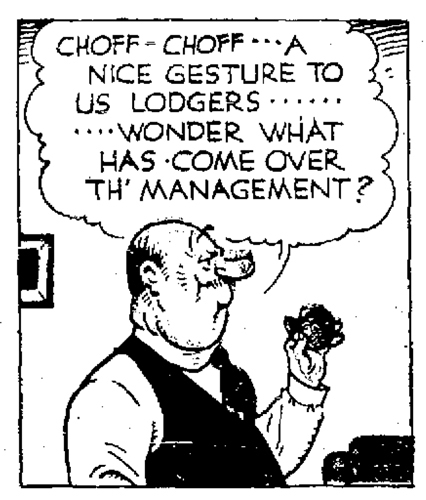 I just read the year of 1927, and nary a CHOFF was seen. 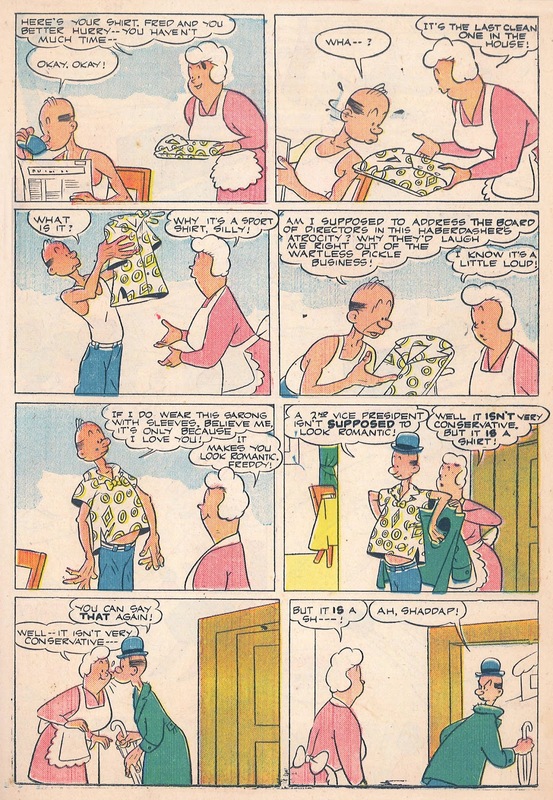 Frank, As you have probably noticed many of the characters in Ahern's strips smoke, and there is a fair bit of coughing. This is always notated as "KAFF KAFF" slightly similar to "CHOFF" in a way. I'll glance through some Ahern from the '40s. A thin version of the "Tubby Type" would be Andy Gump. Thanks for the anecdote about your daughter, Patrick. 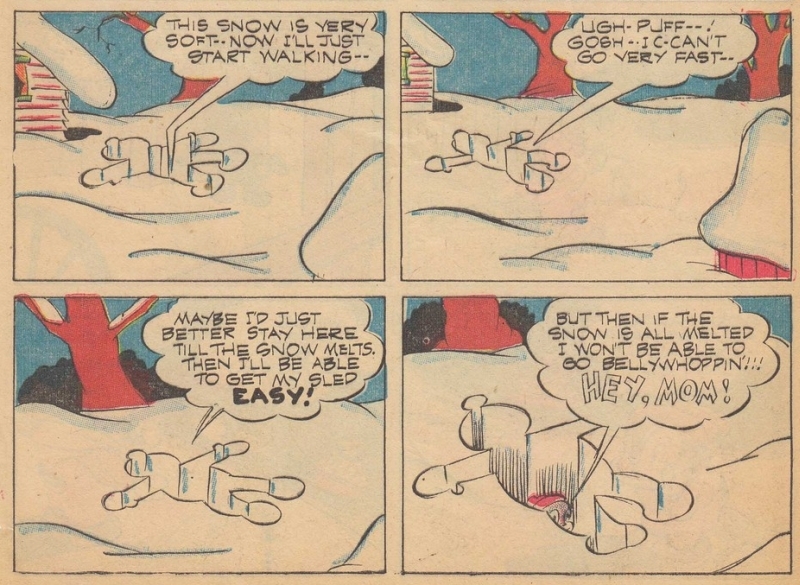 Deliberately not reading Tubby's dialogue... wow! As for Ahern's boarding houses... I'm sure the air quality in them is extremely compromised by all that cigar and cigarette smoke... my eyes water at the very thought. I'd hate to get on the bad side of either Clyde or Mack, too... they are unforgiving nay-sayers! You mentioning Clyde and Mack reminds me to bring up the other proto-Tubby in Ahern's strip; a kid character named Alvin. Alvin is a bit more like the industrious "good" Tubby Stanley sometimes uses. 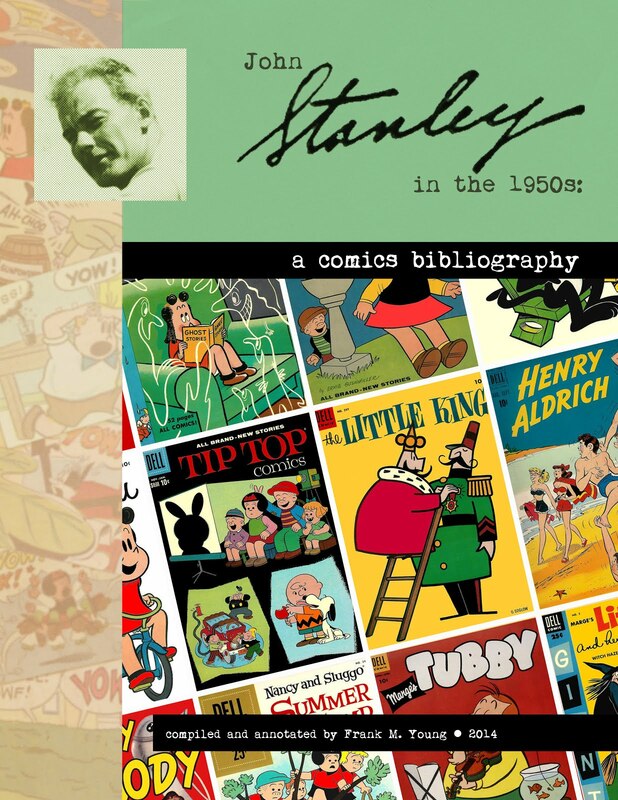 Much like Barks' "good" Donald Stanley sometimes shows us a remarkably energetic Tubby. An example I just looked at showed the Major buying a boxed (contents unknown) lot from a warehouse. 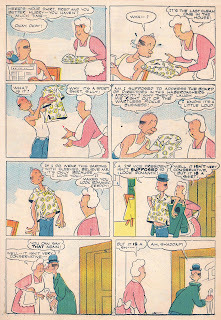 When it turns out to be clothes-pins Alvin offers to take the clothes-pins and sell them reimbursing the Major, and keeping any profit for himself. 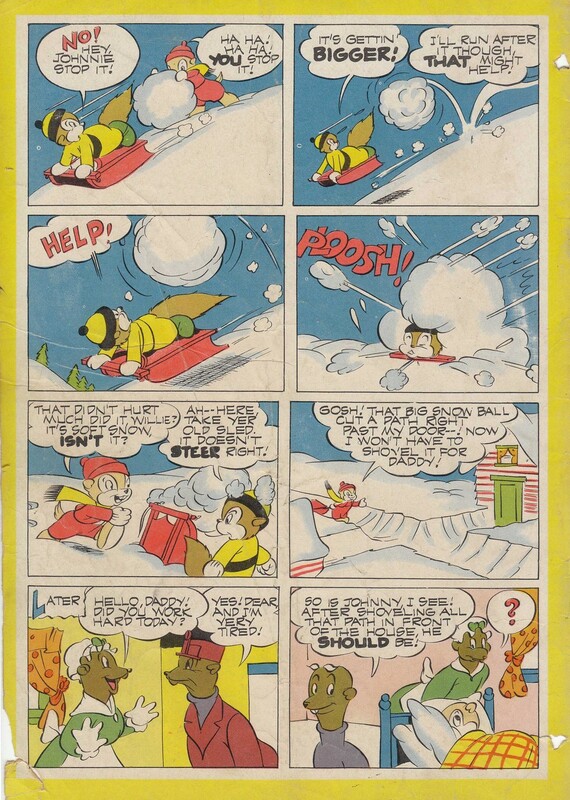 As it turns out Alvin makes ten times what the Major had bid and assumed was a bad investment.